A couple months ago I was asked to host Gorefest, a film fest in Minneapolis, by Chazz DeMoss (Crypticon). Not only did I host, I booked the films. 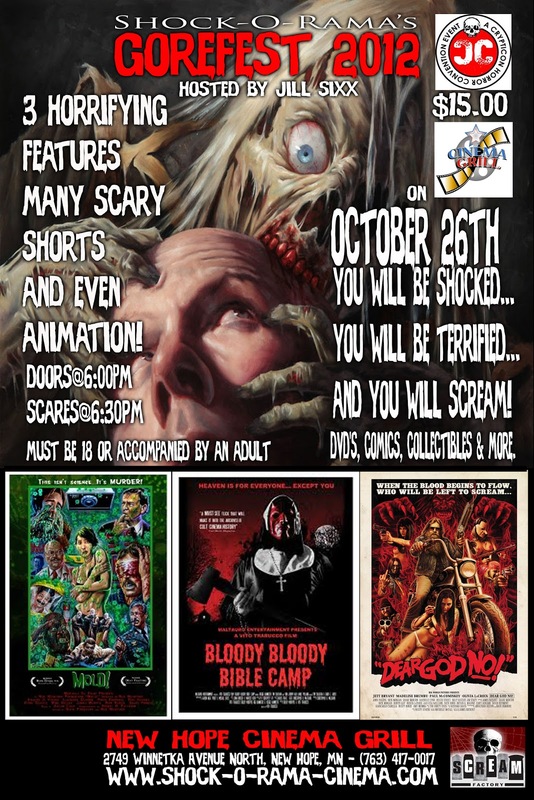 The features that we screened were all films I've shown here in Kansas City at Slaughter Movie House: Mold!, Dear God NO!, and Bloody Bloody Bible Camp. I also brought some of my favorite shorts: Burn, OTHER, and Teddy. This was my first REAL (paid) out of town horror gig! The coolest part about all of this is how I feel about these films. I'm very proud of them and I was honored to bring them to another city. Thanks to everyone involved!